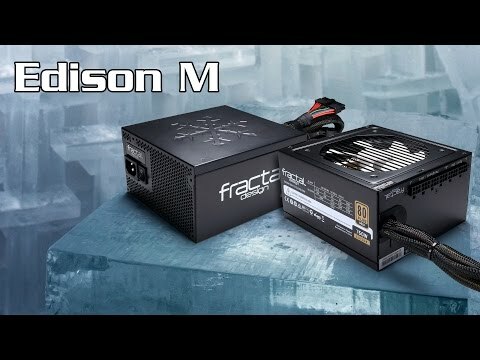 Product Overview The Fractal Design Edison M series of power supplies feature excellent electrical performance, including 80PLUS® Gold certified efficiency. Edison M PSUs meet the 80 PLUS® Gold specification for providing power at an extremely competitive price point, priving excellent value. Additionally, because Edison M PSUs generate less heat, they provide power at lower fan speeds, which results in reduced noise levels. Fractal Design Edison M Series PSUs feature excellent DC voltage regulation and ripple suppression: they can deliver their full-rated wattage continuously even with an intake temperature as high as 40°C at full load or 50°C at 80% load. Edison M PSUs feature Japanese electrolytic capacitors, rated at 105°C as well as Japanese and Taiwanese solid polymer capacitors. Generally, larger fans move more air with less noise than smaller fans: Edison M Series PSUs are equipped with a 120mm FDB bearing, which keeps noise levels at a minimum. Edison M PSUs are equipped with an extra long 12V ("P4") connector cable, which accommodates bottom-mounted-PSU computer cases. Edison M PSUs feature a full suite of computer protection, including: Over Power Protection, Over Voltage Protection, Short Circuit Protection, Under Voltage Protection, Over Current Protection and Over Temperature Protection. Features • Modular construction to assist with a clean build with only the most essential cables permanently attached. • 80PLUS® Gold efficiency with a 5 year warranty on the PSU. • ATX 2.4 compliant, including full support for the new C6 / C7 power states introduced with the 4th generation Intel Core CPUs. • DC-DC design for improved system stability and maximum 12V output. • Tight voltage regulation: +/- 2% for +12V and +/- 3% for minor rails. • Japanese electrolytic capacitors, rated at 105°C; Japanese and Taiwanese solid polymer capacitors. • Extra long ATX 12V cable. • Silent, temperature-controlled 120mm fan with quiet, long-life FDB bearings. • Full protection suite: Over Power Protection, Over Voltage Protection, Short Circuit Protection, Under Voltage Protection, Over Current Protection and Over Temperature Protection. • Sleek look to add to the overall design of your build.